After kicking off the popular “Secrets of a Top Sourcer” webinar series with CareerArc in August of this year, I was excited to return this November to reveal one of the most overlooked approaches to hiring today: social recruiting and sourcing secrets for the Facebook network. For anyone who has started sourcing on Facebook, or is interested in exploring the network’s hiring potential, I urge you to access the free webinar slides and recording which includes a live demo of several tools I personally use to find Facebook talent. However, for those of you who have yet to be convinced, or have others to convince, about the potential of leveraging Facebook as a hiring tool, below are a few compelling reasons to consider. The Monthly Active Users, or MAU, is the widely accepted standard for evaluating the popularity, activity, and overall health of a given application or online network. A high MAU is such a coveted metric among software, web applications, and social networks because it connotes the level of attention, frequency, and activity of a given audience to a given platform. Today, Facebook boasts the largest amount of monthly active users, currently 1.79 billion and counting. Facebook monthly active users are registered users who log into the platform and performs a significant action at least once within the last 30 days (see Facebook’s complete definition of their MAUs here). The graph below clearly illustrates Facebook’s dramatic reach. If you take the 3.7 billion people who have internet access, nearly half use Facebook regularly. This is an astonishing number and one which has not stopped growing since Facebook’s founding. Now compare this number to LinkedIn’s 106 million monthly active users. 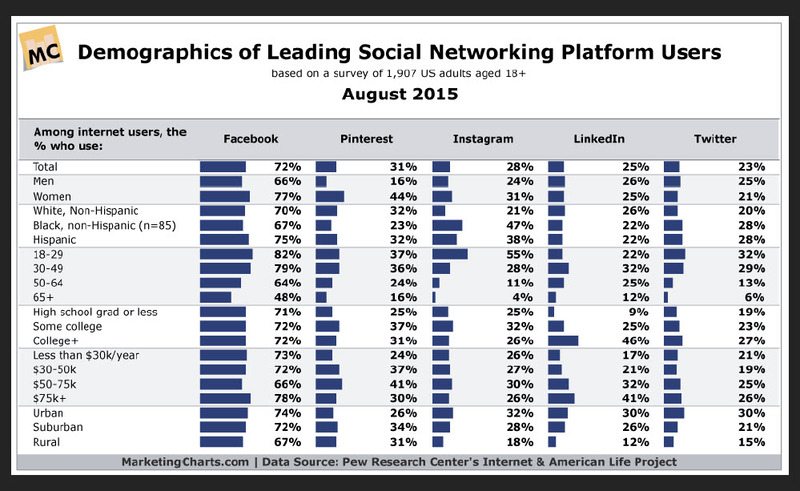 If you were to compare this to a deck of cards there would be 17 Facebook cards to every one LinkedIn card. 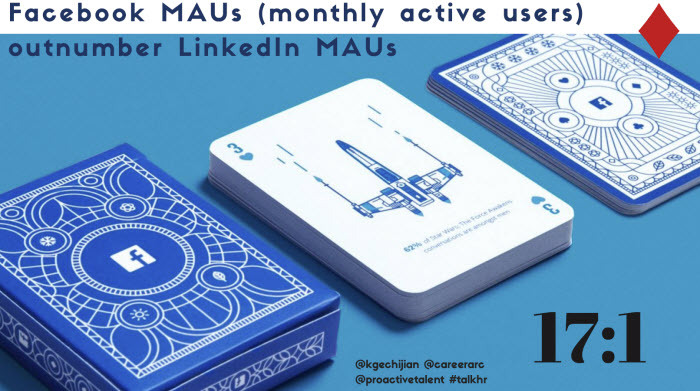 Because that monthly active user number is so strong you will have a lot more chances of being dealt that ace candidate than you might if you were simply looking on LinkedIn. Platforms with high MAUs generate a lot of user activity, and as a sourcer, it is crucial to prioritize social networks that have real organic traffic. 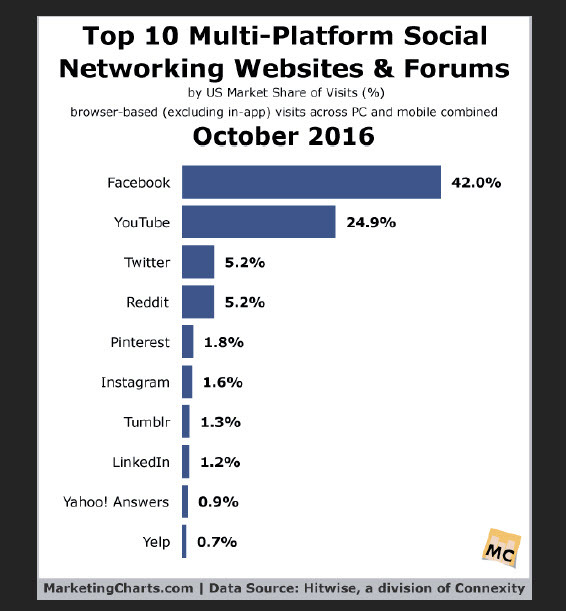 Below is a list of the Top 10 Multi-Platform Social Networking Websites and Forums where Facebook is the clear front runner. The data is based on US market share of visits, meaning 42% of all US internet users visit the Facebook.com domain. 42% of the US market is visiting Facebook, in comparison to the 1.2% of the market visiting LinkedIn on a regular basis. In addition, you can surmise pretty quickly that there’s going to be a real authentic fresh and up-to-date information in a platform that’s getting this much traffic. Lastly, and this is perhaps the most compelling reason to use Facebook for sourcing: The Facebook audience is incredibly diverse. Keep in mind that this graph again represents the number of U.S. adults accessing the internet. So looking at the Facebook column, you will see that 77% are women, and compare that to only 25% of women accessing LinkedIn. If I was a hiring manager looking for women in STEM fields, and I had to choose between reaching only 25% of the national population, versus 77%, the choice is a no-brainer. This graph shows the expanse of Facebook’s reach of people across several demographic categories–race, age, income, educational background, and more–and further supports how this audience is authentically being driven to Facebook at the numbers and the velocity that is not matched by others. Now you know why I find Facebook to be a game-changing platform for today’s hiring professionals. But how do you expertly source talent on Facebook? In sum, when looking for prospects on the social web, the larger, more engaged, and more diverse the audience, the better. 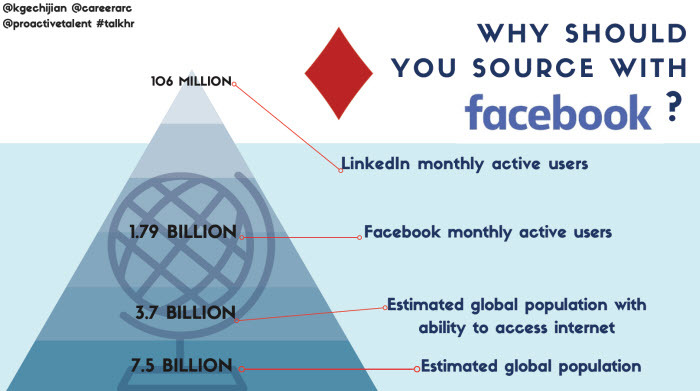 I hope these stats help paint a really clear picture of Facebook as one of the richest talent sources available today, and the possibilities this presents to talent acquisition professionals and job seekers alike. Do you have any Facebook sourcing tips to share? Connect with Katie at https://www.linkedin.com/in/katiegechijian and @kgechijian. Katie Gechijian is a Lead Consultant at Proactive Talent Strategies focused on Recruiting Optimization, OnDemand Recruiting, and Sourcing Coaching/Training using diverse techniques and technology. She has spent the last fifteen years in financial services talent acquisition, most recently as a Vice President of Talent Acquisition at Wells Fargo where she created and led the Enterprise Sourcing Forum. Earlier this year, she placed second out of more than 1200 participants in the “2016 World’s Greatest Sourcer” competition, held by Entelo & The Sourcing Institute. 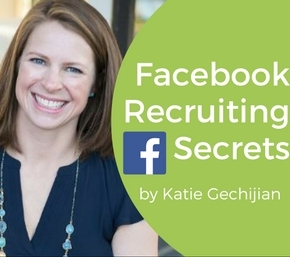 Katie Gechijian reveals why and how to source talent on Facebook, as well as the tools you can use today to recruit the best candidates.